These socks were four years in the making. And the finished timing just couldn't have been more perfect. Fall has blown in and has me feeling completely giddy. I wanted them super slouchy. The pair that is worn in the mornings and evenings. Thrown on in the autumn months before I get out the much needed Uggs for winter days. The yarn was gifted to me from my dear friend, Sifis. I met Sifis first on line through his flickr groups. And then I met him in person when my mom and sisters and I were visiting his beautiful country, Greece. Sifis owns a lovely yarn shop in Athens that has been in the family for three generations. Established in 1935. That just makes my heart warm and makes these socks just that much more special. A little bit of that amazing trip and his world, knit into each stitch. OKAY...you're killing me! Sending belated best wishes to Charlie on his birthday...and yes, your socks are beautiful, but time to come clean with your news! The suspense is killing me...make my day with all the delicious details...p-l-e-a-s-e!!! These socks are great!!! Very comfy and perfect timing. 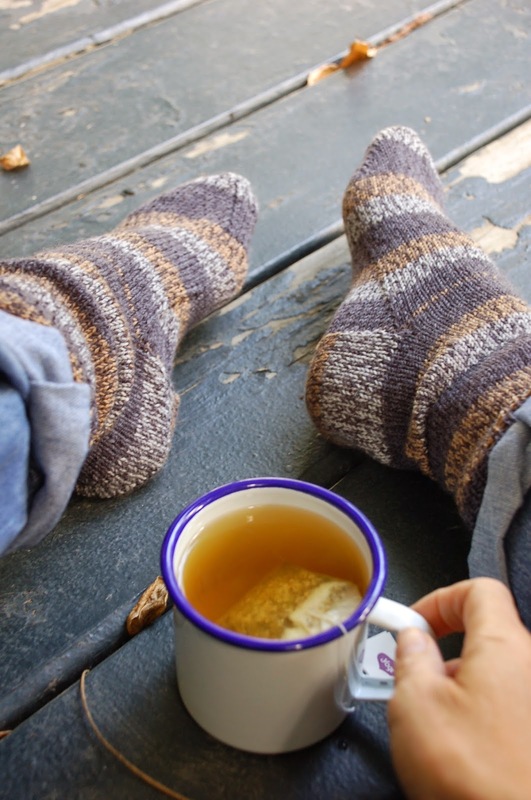 A perfect way to start and end the day...Socks and tea! What a nice story for these socks! They look so cozy! Love when the yarn reminds you of someone/something. I LOVE the colors! I am totally with Maureen. Every word. Dish, already, woman!!!! Beautiful socks! Fall is in the air here too and it feels wonderful. I met Sifis on a trip to Athens several years ago...it is so fun to have fiber friends all over the world. Socks with a story. The best kind. We are not up to fall weather yet. I suppose that means I should be knitting now so that I'll be ready when cool weather does come. What a great back story to these socks.